Like many of its magazine publishing peers, Time Inc. has spent the past few years furiously working to reposition itself as a multiplatform media company. In the last year alone, the company has acquired big-name digital brands (like xoJane and HelloGiggles), launched several of its own (including Motto and The Drive), made a massive investment in data with the purchase of ad-tech company Viant and experimented with new products like Instant, a social video influencer platform. 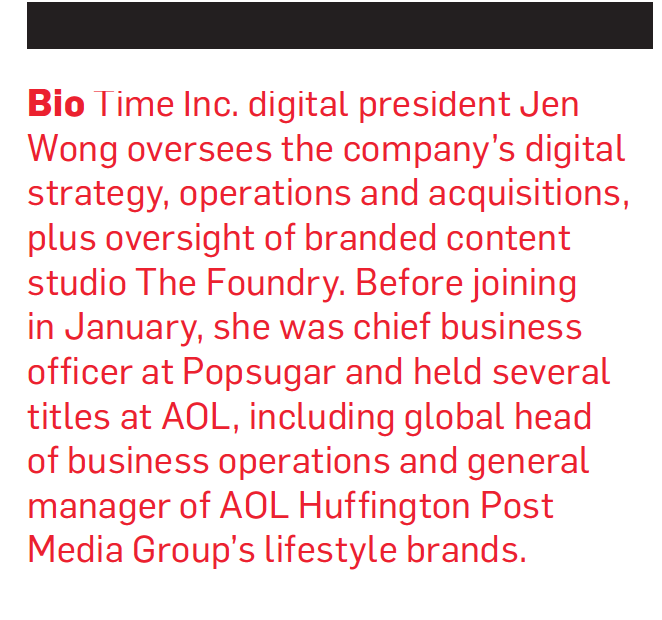 Leading the charge is president of digital Jen Wong, a former Popsugar and AOL/Huffington Post executive who joined Time Inc. in January. Adweek spoke with Wong about her expanding role, her company's focus on millennials and how she plans to move Time Inc. forward. Adweek: In addition to overseeing Time Inc.'s digital brands, product and engineering, you were just recently put in charge of its branded content studio, The Foundry. What does that entail? Jen Wong: The Foundry is actually a very important part of our strategy in the future. It was built because we wanted to go deeper into branded and native content on a big scale. We have native studios at each of the brands, so what we're doing now is moving them under The Foundry and creating one creative studio that still has a sense of each brand. Each of the people [at The Foundry] understands Time, Fortune, Money, People, EW, etc., and their voice and sensibility, but now they're client-facing and they're able to be that bridge between the brand and the client. Over the past few years, Time Inc. has made more of an effort to integrate the print and digital teams within each brand, whereas other publishers like Hearst have more independent digital departments. Where is Time Inc. moving now? Before I came, digital was under each of the brands. When I got here, it all came under me, which means that we can speak with one voice from a product perspective and now also from a sales and editorial perspective … [Our digital editors] are still sitting with their brands, working with them, but there's more collaboration across brands. The idea is to get to one digital process, one set of platforms, one way of operating. We've also seen a lot of publishers repurposing the same content across brands. Is that something you want to do more of? But sometimes that strategy can feel forced when the brand voices don't align. Are you worried about that? I think the brands will continue to have separate voices. One of the things we've been thinking about is, what is the right way to share content? I'm not convinced that it should be a straight repost. We're trying to be a little bit more thoughtful and use tools to curate the content so it still feels like the right brand. You mentioned at a Time Inc. investor day earlier this year that you want to build the company's ecommerce business. What's your plan? It seems like so many publishers have tried and failed there. Oh, yeah. I'm very cautious about it because I feel like there's definitely a right and wrong way to do it. Look, if you stick a product module on every post, it's not going to work. We know that. We're not that low in the funnel. But then you look at companies like Wirecutter and they're making content that's naturally transactable and low in the funnel, and that does work. Now, is it going to be a billion dollars of revenue? Probably not. But could it be material revenue? Sure. Another thing we're very interested in is carts and mobile web checkout. A $500 pair of shoes is probably going to take longer consideration, but we tested a cart [on InStyle.com] for a $20 dress at a mass retailer, and I think we sold out the inventory. So for something that's $20 or even $50, we know we can move decent volume on it, and that's a good value proposition. Most of Time Inc.'s recent digital acquisitions and launches, from xoJane to HelloGiggles to The Drive, have been millennial-focused. Is it your ultimate goal to own that space? I don't know about own it, but we're big enough that we have to cover every audience, and millennials are a pretty substantial cohort. But honestly, if you look at the demos of our core brands, they have a lot of millennials already. People.com, which has 40 million UVs, is 50 percent millennials, but nobody believes that. When you look at the number of millennials that sit on that property versus the number of millennials that sit on a smaller domain, we have more. It's something that I get fired up about because we have millennials in our core properties—and there's this perception that we don't. What's your next big social push? Snapchat continues to be really important. We've done some stuff with Wishbone, which is very Gen Z. It's like Instagram, but you choose x vs. y, so it's good for things like red-carpet [coverage]. People has done some stuff with them. And I'm watching Whisper. I view them as an incredible pulse on the sentiment of certain geographies. If you were to ask, "How do people feel about the election right now?" they would know what that sentiment was like across America by geo. That's really valuable information for brands like Time or People.